Texans take pride in a lot of things, and barbecue is by far no exception. I’m one of those Texans. I love to barbecue all types of meats, especially brisket, which is a deeply guarded Texas tradition. 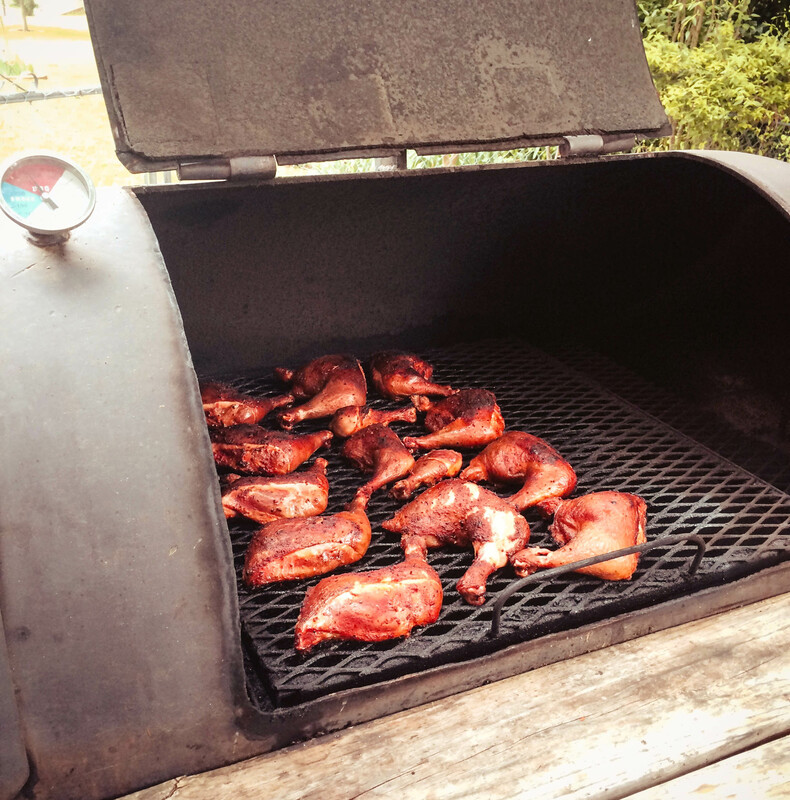 But today, I want to share with you my recipe for Smoked Chicken Leg Quarters. This type of meat takes a lot less time on the pit than its beefy counterpart. I also think it’s a great place to start if you’re new to barbecuing or “smoking”, as we like to call it. I teamed up with Heinz for this post to try out, and talk about their new line of barbecue sauces, specifically the Heinz BBQ Texas Bold & Spicy BBQ Sauce. The cool thing about this sauce is that Heinz teamed up with Robert Sierra, pitmaster of the Texas state grand champion S&S pit crew competition barbecue team from San Marcos, Texas to create an authentic Texas style barbecue sauce. They brought in a lot of Texas flavor by using cumin and chili powder, which I love and use in a lot of my cooking. Heinz Ketchup is one of the brands I don’t ever substitute, because they use all natural ingredients and the taste is always very good. There are some ingredients that are too good to trade out. Knowing how good their ketchup is, I wagered that their new BBQ sauce would not let me down in terms of great taste and natural, quality ingredients. 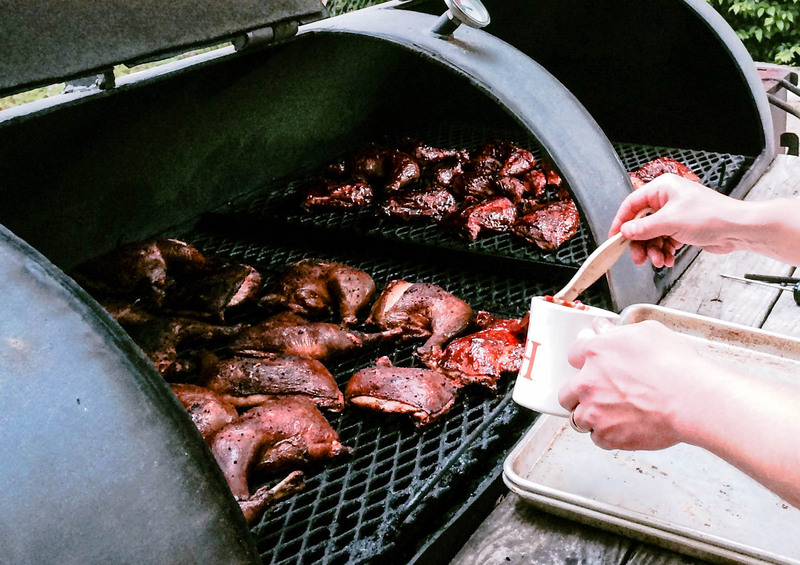 Just about everyone in Texas has their favorite way of doing things, and especially when it comes to barbecuing. This is my method of seasoning and smoking these two types of meat, it works for me and I love the finished product. First we start with a dry rub. 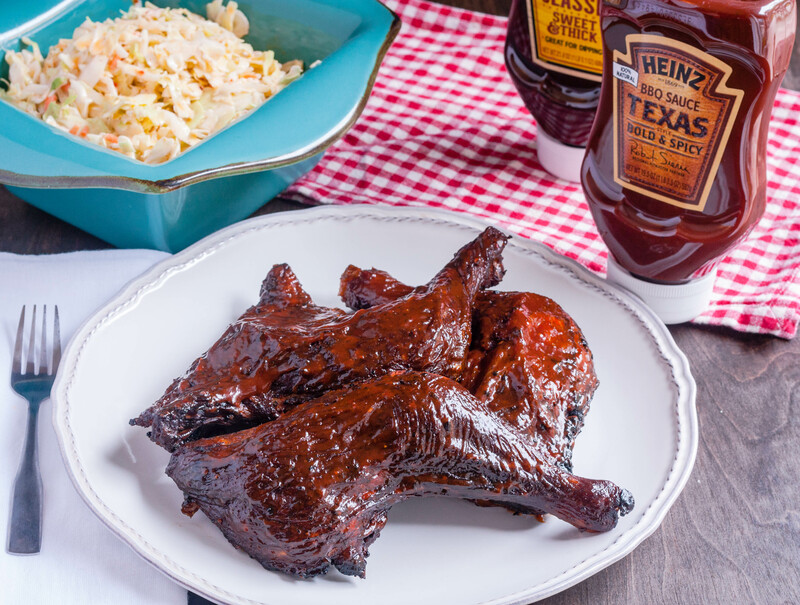 We’ll smoke the meats with dry seasonings and finish them with the Heinz BBQ Texas Bold & Spicy BBQ Sauce. Starting with the leg quarters, rinse them under cool water and cut off any excess globs of fat and discard. Once all meat is rinsed and trimmed, pat them dry on both sides with clean paper towels. Next, I like to generously sprinkle the meat with handfuls of the rub and then “rub” it in with my hands. Make sure to not double dip back into your fresh seasoning blend so as not to contaminate it. I typically do this the night before so that the meat can more or less “marinate” in the seasoning. Cover and refrigerate the seasoned meat for several hours or overnight. Prepare your BBQ Pit or Smoker for cooking. 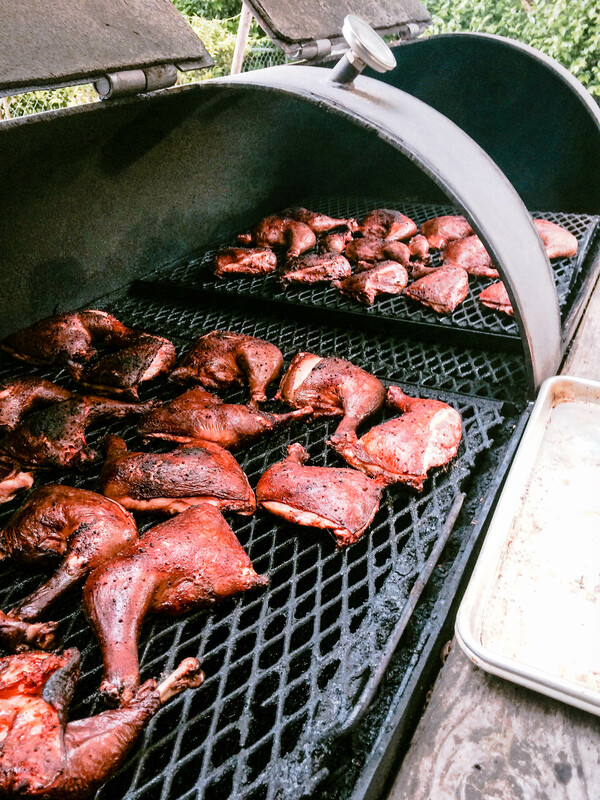 I use a very large smoker that my friend, Kendall, lends me from time to time, so your process may be different depending on the type and size of your smoker. I start with very dry Oak for heat. Once my firebox is burning, I close all of the lids to the pit to let the racks burn off. After a little while, brush the hot racks with a wire brush to clean off any charred debris. Close the pit doors again and continue heating until the smoke turns from gray to “clear”. Really, it’s the heat you’re seeing. At this point, adjust the flue to regulate your heat. For chicken, I like to smoke it at around 250 degrees. While the pit is heating up, remove the seasoned chicken from the refrigerator. As I’m placing the meat onto the pit, I generally like to season the tops again with a little more dry rub, just for added crust. Once all of the chicken is on the pit, close the pit doors and sit back with a glass of iced sweet tea and relax for a while. I like to smoke the chicken for about 2 to 2 1/2 hours, regulating the heat at 250 degrees. Temperature is more important than time, so make sure you are checking the gauges on the pit as well as have an instant read meat thermometer on hand to take the internal temperature of the meat from time to time. When the meat has reached an internal temperature of 165 degrees, I like to mop it with a good bbq sauce and glaze the meat for about 10 minutes more. I used Heinz BBQ Texas Bold & Spicy BBQ Sauce for this job and I really liked how everything turned out. The best part is digging in and tasting the finished product! I was very impressed with Heinz BBQ Texas Bold & Spicy BBQ Sauce. It was smokey, slightly sweet and had a nice spiciness to it that made this smoked chicken really pop with flavor. In a large bowl, combine all dry ingredients and whisk well to combine. Rinse chicken leg quarters under cool water and cut off any excess globs of fat and discard. Once all meat is rinsed and trimmed, pat them dry on both sides with clean paper towels. Generously sprinkle the meat with handfuls of the rub and then “rub” it in with my hands. 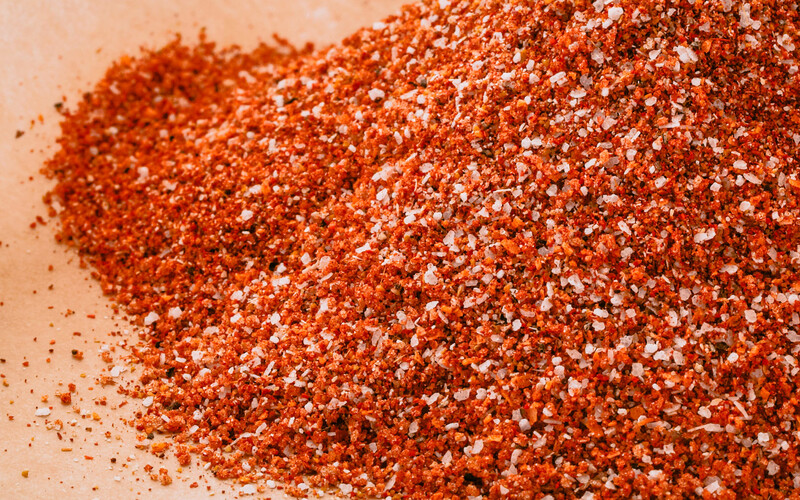 Make sure to not double dip back into your fresh seasoning blend so as not to contaminate it. Cover and refrigerate the seasoned meat for several hours or overnight. Prepare your BBQ Pit or Smoker for cooking. Start with very dry Oak for heat. Once my firebox is burning, close all of the lids to the pit to let the racks burn off. After a little while, about 10 minutes, brush the hot racks with a wire brush to clean off any charred debris. Close the pit doors again and continue heating until the smoke turns from gray to “clear”. Really, it’s the heat you’re seeing. At this point, adjust the flue to regulate your heat. For chicken, regulate it to 250 degrees. While the pit is heating up, remove the seasoned chicken from the refrigerator. Place the seasoned chicken leg quarters onto the pit in one single layer. Season the tops again with a little more dry rub, just for added crust. Once all of the chicken is on the pit, close the pit doors and sit back with a glass of iced sweet tea and relax for a while. Smoke the chicken for about 2 to 2½ hours, regulating the heat at 250 degrees. Temperature is more important than time, so make sure you are checking the gauges on the pit as well as have an instant read meat thermometer on hand to take the internal temperature of the meat from time to time. When the meat has reached an internal temperature of 165 degrees, mop it with a Heinz BBQ Texas Bold & Spicy BBQ Sauce, close the doors to the pit and cook the glaze on the meat for about 10 minutes more. Remove from pit and let rest for 10 to 15 minutes before eating. If time permits, rub seasoning into meat the night before. 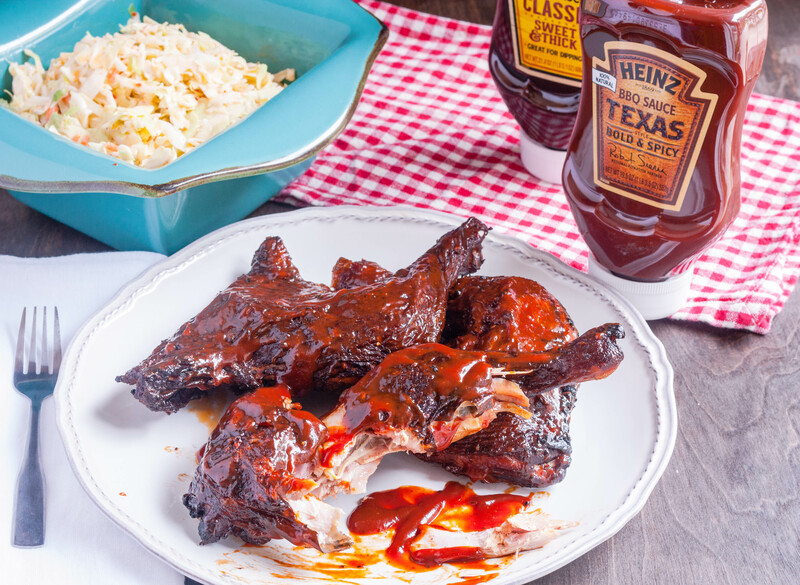 Find more great recipes using Heinz BBQ Sauce here!